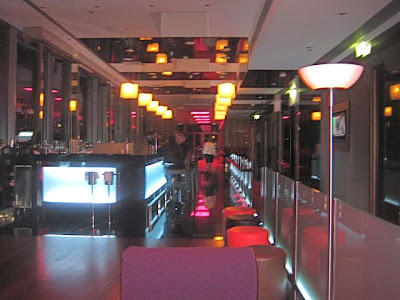 Cloud 9 Sky Bar & Lounge first floated onto my radar screen at the 2009 Prague Food Festival. The beef satay from their stand was a little dry, but I had a feeling they could do better on their home turf. More recently, I checked out the internet menu of this relatively new cocktail spot on top of the cube-like Hilton Hotel, which is not to be confused with the Hilton Old Town. There were a lot of tempting items, and I thought the cocktail prices looked relatively reasonable for such an upscale place. And I was curious. 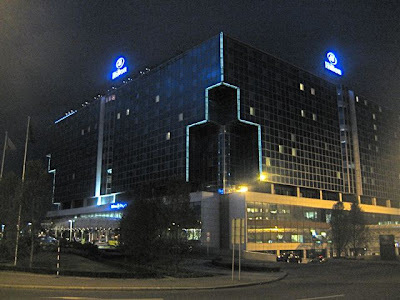 Despite many years in Prague, I'd never set foot in this Hilton, which boasts a top-end restaurant. Something about the location and the architecture put me off, even though it's pretty close to the Florenc metro station and bus stops. The other night, I walked into the atrium and eventually found the special mirrored elevator up to the roof. 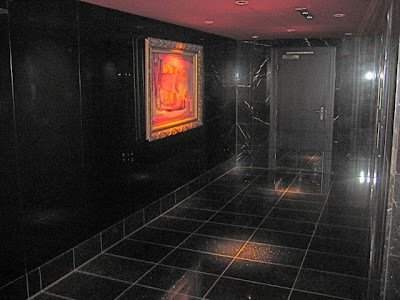 I came out into a dark black marble hallway. 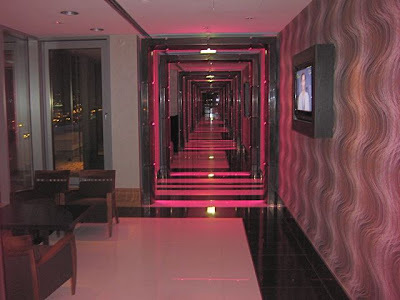 When I turned the corner, there was a corridor that looked liked the entrance to CONTROL headquarters in "Get Smart." Lights around each section blinked on and off in succession, bidding you to follow. Just before entering the cocktail lounge, I passed one of the terraces. 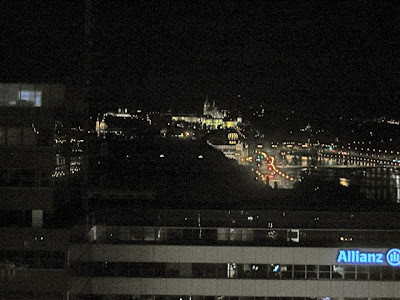 There was a somewhat distant view of Prague Castle, sitting above a much closer insurance company office building. 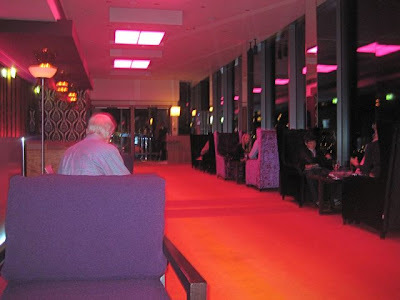 I turned right past a well-dressed, well-muscled door man and walked into the purplish-hot pink seating area. I discovered they can alter the colors and the lights came down more later on. Techno-style music, which fit the decor, was played at an acceptable level. But it was not exactly my favorite style. A bevy of attractive hostesses descended upon me as I sought out the optimal place to sit. I walked with them over into the second section of the lounge, but there were only four-seaters there. So, I went back to where I started and sank down into a comfortable chair at a two-top. V was out of town -- I was going to have to manage solo once again. I was surrounded by, from what I could tell, were mostly hotel guests. There was a spread of age ranges. A fair number of Americans. They started me off with some chips and nuts. They may not look like much, but these were some of the best cocktail snacks I've had. 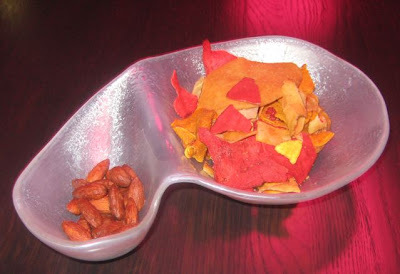 The chips, which were a wide variety of shapes, sizes and colors appeared homemade. The waitress told me they were all potato, but they all had different flavors, from slightly sweet to salty to spicy. There were also slightly sticky sweet and salty almonds. For a start, I ordered one of Master Bartender Roman Uhlíř's "Signature Cocktails," called a Mystic (160 CZK). It was vodka, lime, homemade ginger syrup, and brown sugar. It was quite sweet, with a hint of lime-like bitterness. I was disappointed the ginger flavor was not more obvious. The Mystic wasn't bad, but I'd prefer the similar, but rum-based Jamaica Mule served at Bukowski's. Even though I'd already eaten earlier in the evening, I felt it was my duty to eat again. 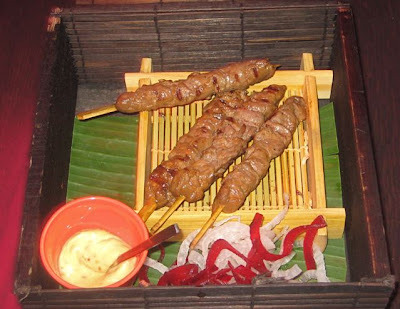 I had to try that peppered beef satay (260 CZK). I was impressed by the very tender, top quality meat. It was exactly the kind of beef a place like Essensia at the Mandarin Oriental should be using, rather than the chew toy they served on our recent visit. Cloud 9's beef, with its soy marinade, was just a tad too salty. On the side, there was a sesame oil mayo. I wish there was a better accompaniment. I could hardly taste any sesame, and mayo is far from my first choice of beef condiment. That part just didn't work for me. Still, I was enjoying it and was down to my last couple of bites when the waitress came to take my finished drink away. Unfortunately, she spilled the crushed ice from the glass all over the table and some into my lap. She apologized and cleaned up quickly as I cleared the ice from my chair and checked that my mobile phone survived. I didn't realize until she was gone that she had whisked away my unfinished bites of beef. I didn't feel like complaining and asking for a replacement or discount over so little, but I wasn't terribly happy about losing some food, either. 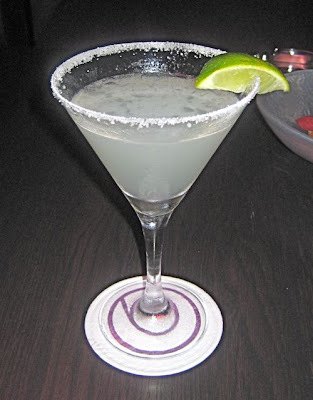 For my second drink, I ordered the New Classic Margarita (250 CZK). 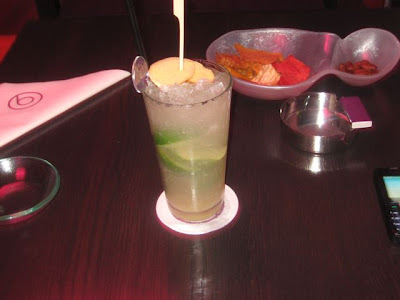 The drink was made with 100% agave tequila, Cointreau, fresh lime juice, and agave syrup. The price was eye-popping, but I hoped it would buy me something special. Thankfully, it was excellent. It suited my taste, not too sweet, just the right sourness level from the lime, and it clearly packed a smooth punch. I was only slightly disappointed it came in a fairly small martini glass. To go with this drink, I ordered the tuna tartare (290 CZK). It looked small in the picture on the website, but I thought it was a reasonably generous portion. The tuna was sandwiched between very light crackers. I could taste wasabi and ginger mixed in. Really good. It said it came with avocado, and there was a dab of green stuff on each cracker. But I wouldn't have known it was avocado unless someone told me. The menu mentioned tomato, but I didn't see or taste any. Perhaps it blended in too well with the red tuna. The wasabi cream on the side was pleasantly sharp and a little sweet, but I used it sparingly. The batter-fried onion strings on the side weren't bad, but very messy and awkward to eat. While not perfect as a whole, the tuna itself was so nice, I thought it worth the money. For my final cocktail, I ordered something called an Elise (160 CZK). As if it wasn't embarrassing enough, I had to repeat the name three times before the waitress understood what I was asking for. I'm still asking myself why I ordered this strange concoction. 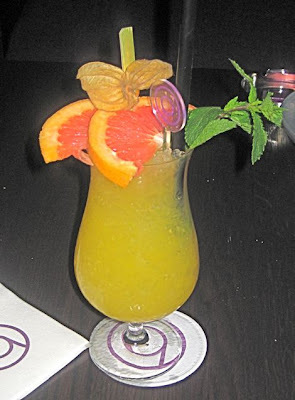 It is made with gin, limoncello, peach liqueur, mango, grapefruit juice, and orgeat syrup. My initial thought was this cocktail would be too frou-frou. Then, I thought I shouldn't be so closed-minded. Essentially, I only ordered it because I love limoncello. It was cloyingly sweet, but with the bitterness of grapefruit. I picked up a hint of mango, but I really couldn't taste the limoncello at all. The orgeat is supposed to give it an almond flavor, but I didn't notice it, either. This drink might work for someone else, but I really didn't like it. I ordered one more round of food and had the bruschetta with port-marinated duck foie gras and fig marmalade (290 CZK). The marmalade was extremely sweet, but it balanced out on top of the buttery, smooth, creamy liver. The bread was good quality, but could have been toasted (or better toasted). It was simple, but a satisfying dessert of sorts. I know foie gras, even from ducks, isn't that cheap. True, it was a rich few bites. But the plate looked pretty empty, and it felt unsubstantial for the money. I had a fairly favorable opinion of the bar during the first visit, but things got a little more hazy after the second. 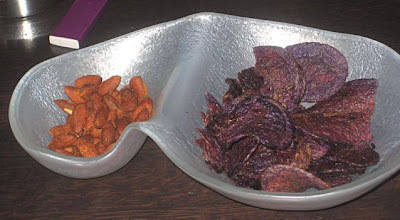 On that one, they still had the nice almonds, but the chips had changed. These were all the same -- almost black in color and appeared overcooked. They didn't taste burnt, but didn't have the most pleasant flavor, either. I decided another "signature" cocktail was in order. I got the Black Pearl (165 CZK). It was made with premium Vodka, Chambord, Grand Marnier, cranberry and fresh lime juice. 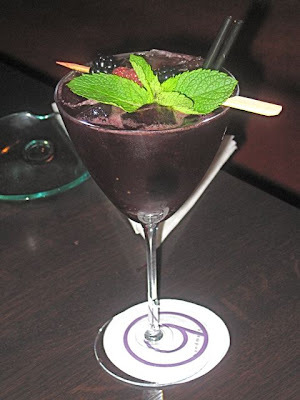 It had a great color, with great blackberries and raspberries as garnish, but that's the best I could say about it. It was just too sweet. I could taste the cranberry and chambord very clearly. But I missed any sense of tart balance from the lime or orange flavor from the Grand Marnier. The food menu tempted me once again. The teriyaki duck in rice paper rolls were delivered to my table (240 CZK). 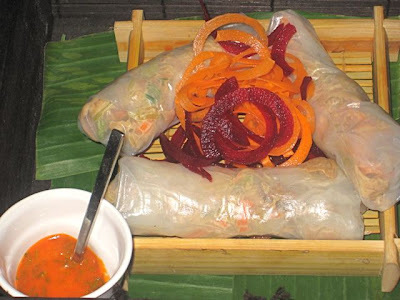 These cool, tightly-wrapped rolls, had the right look and some heft to them. There was a chili sambal on the side that was very spicy, peppery, and slightly too salty. What I found inside was disappointing. It was all very fresh, but sadly bland. I could barely detect any teriyaki flavor. The duck was so flavorless, it could have been chicken. There was some crunch from the greens inside. The texture was right, but not the taste. There was no basil or cilantro (coriander), as far I could tell, which would have seriously helped. 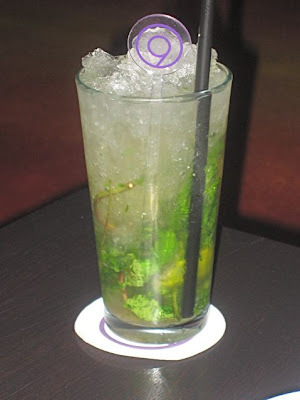 Then I got a mojito (160 CZK). I've had many great ones at a number of different bars around Prague. This was not one of them. It was too sweet, and there was still a lot of undissolved sugar at the bottom. It did have plenty of mint, which was good. But again, the sour notes were really lacking. Not enough lime. Finally, I continued my quest for something sublime with lime. 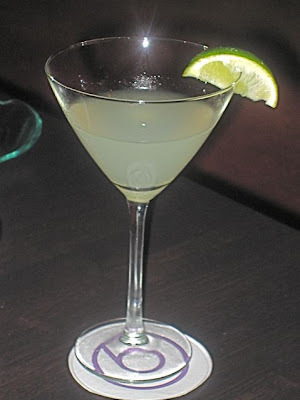 I got a Gimlet (140 CZK). This is one of my favorite cocktails, but it was not sublime. It was subprime. It was super-pucker sour, tasting like pure lime juice and gin. A classic Gimlet is made with Rose's lime juice, which is sweet. There was nothing sweet about this drink. And to top it off, it was a very ungenerous pour. The small martini glass was more than half-empty. 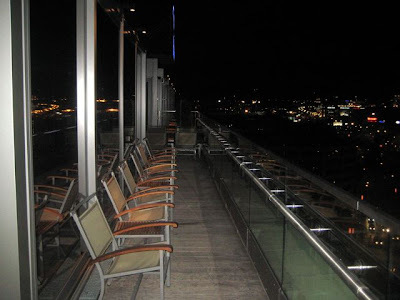 Cloud 9 Sky Bar & Lounge is not the type of place I usually like to hang out. It was pretty stylish, but the clientele does give it something of a hotel feel, however upscale. It did have a good view, comfortable chairs, some enjoyable dishes with not completely insane prices. That's relative, of course. My total bill for the first visit came to 1410 CZK, not including tip. If V was with me, it probably would have been closer to 2500 CZK. The second trip cost me 705 CZK. If you'd have asked me after my first visit, I'd probably recommend the bar for a date and a few little bites to eat. But after the second visit, my opinion changed. There were just not enough shining moments and too many dark clouds raining on my cocktail parade. i'm just curious if you'll have a look also at some restaurants as alchymist hotel, alchymist nosticova, casa andina, la cantina, kolkovna or no stress.